Well I don't know about where you live, but over Memorial Day Weekend, Summer weather arrived here with a vengeance. The temperatures soared into the 90s, and it was finally time to break out the shorts, flip flops and those beloved cropped pants. Each Wednesday, I share real fashion ideas and inspiration to help you get dressed in the mornings and highlight at least one outfit that I'm wearing right now, as well as provide tips for finding great outfits in your own closet. This week, I'm sharing three tips for styling your cropped pants. There's a lot of discussion about cropped pants and whether they are "in style" or not. The first thing I am going to tell you, is that if you Google cropped pants, every big name has them in stock: J. Jill, Old Navy, Nordstrom, Macy's. So, while you may not see them in the fashion magazines, real women such as ourselves are buying them and wearing them. Since we are spending our hard earned money on them, they should look as good as possible - right? 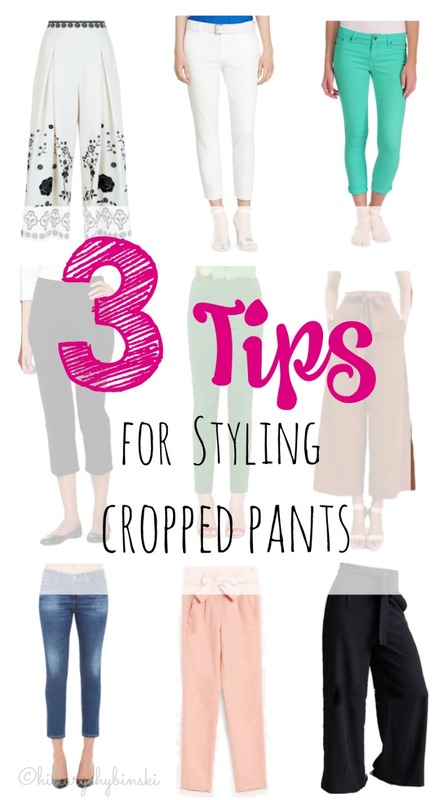 Cropped pants can be a tricky thing to wear. Today, I'm going to share three tips for styling cropped pants so that you always look your best when you toss yours on. Properly fitting cropped pants should not be too long or too short, or generally speaking, too wide. I am short and curvy, so I really struggle with a good fit on cropped pants. 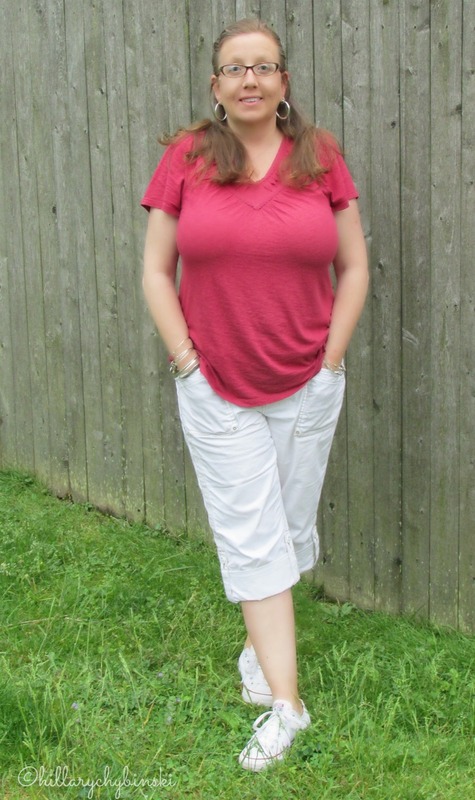 As an Aventura Clothing Ambassador, I received a pair of their Arden Capris to try out. Not only are these pants uber comfortable, but they follow the line of your leg, making the fit a good one. And with the ability to roll or unroll, they are the perfect length! The stitching and casual style, just add to the great look they give. De we ever truly have the right pair of shoes on hand? With cropped pants, you can adjust the shoe, to the style of the pants. 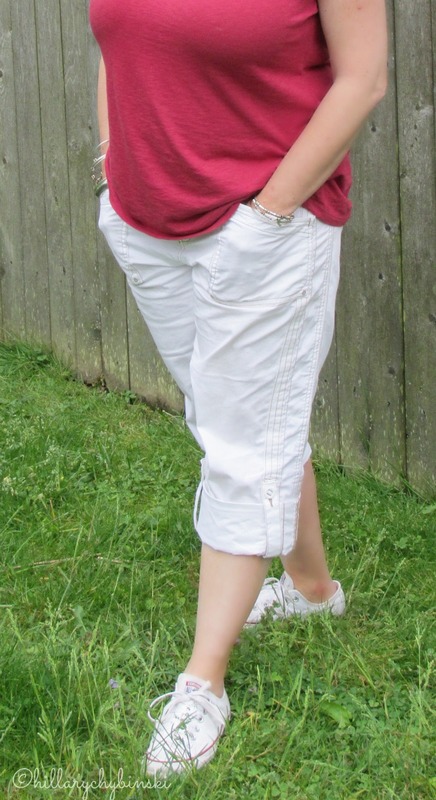 A more casual pant, like the one I'm wearing, works best with a sneaker, flip flop or sandal. But that doesn't mean you can't be stylish - right? Slimmer fitting cropped pants look best with a flat or even a kitten heel. If you want to try a wedge or stack heel, check the proportion of the pant length, your height and the pant width. It can be done wonderfully on some women. These would look great with a low wedge slip-on for a dressier look. Color matters. A great pair of bright cropped pants can be really fun. But again, depending on the fit, may not be a great choice for your body. If you are curvy like me, you may want to stick to slimming neutrals. Some experts suggest sticking to tones close to your own skin tone - so if you are dark skinned, try olive, black or brown and if you are light skinned, stick with white, cream or tan. Personally, I think a great-fitting pair of black cropped pants, with a small heel is a fantastic go-to summer look for just about everybody. So my friend, you can wear cropped pants, and still look stylish and on-trend! What is your favorite pair of cropped pants right now? This post is linked up at Jo-Lynne Shane - be sure to check it out for even more outfit ideas and inspiration. Those pants look great on you! I need a pair!!! !